Below is a schedule of the informal LASP Magnetospheres Seminars for the Spring Semester 2010. Except where noted, seminars will be held on Tuesday afternoons in room LSTB-206 at 3:30 pm. March 2, 2010 Magnetosphere-satellite interactions at Io, Europa and Enceladus: Why bother to make measurements when we can just make models! Abstract: We assess the contribution of solar forcing from the interplanetary magnetic field (IMF) Bt and solar wind velocity (Vsw) on the auroral inputs from intercalibrated NOAA and DMSP satellite-track in-situ particle measurements. We compare the NOAA/DMSP to GUVI global electron power (Pe) variations with geophysical indices. Periodicities in Vsw, Bt, Pe, and ion power (Pi) are calculated using Lomb-Scargle (L-S) and wavelet analyses. We examine several different solar minimum periods. 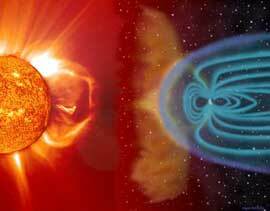 The first Whole Sun Month (WSM) interval (96223-96252) had a strong solar magnetic dipole. Strong ‘semiannual’ equinoctial periodicities of ~20% variation in Vsw and 40% variation in Pe were found. In the present solar minimum, the solar magnetic field is weaker with larger quadrupole components during the Whole Heliospheric Interval (WHI, 08080-08107). Strong 9-d amplitudes of ~30% variation in Vsw and ~40% variation in Pe and Pi were found. This 9-d periodicity was also found in the IMF Bt, in the CHAMP neutral density at 400 km, and in the outer radiation belt electrons >2 MeV in 2008. In 2009, the 9-d periodicity disappeared and the 13.5-d periodicity was strongest. Minimum values of 81-day Pe and Bt values were found between 09016 and 09098, while Pi minimums were on either side, Vsw minimums occurred between 09150-09162, and Kp minimums were latest between 09213-09293. We use GUVI images to determine the electron auroral inputs in the TIEGCM model as a function of MLT, Kp, and season.